I’ve noticed a lot of people surfing in on searches for “dysthymia” or even “teenage dysthymia.” It’s a sneaky disease because one of the symptoms is that it makes you think you’re normal. Doesn’t that seem unfair? 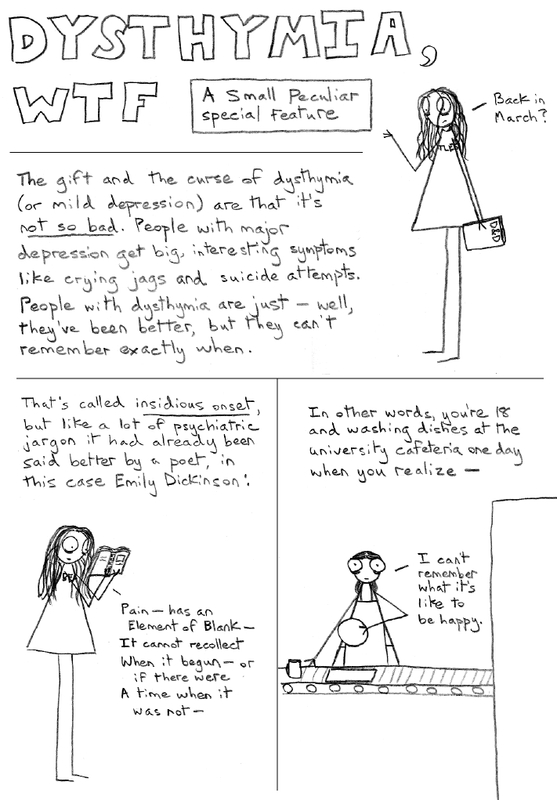 Cancer doesn’t make you think you don’t have cancer; but dysthymia tells you that there’s no such thing as dysthymia because there’s no such thing as happiness. If you are one of the people surfing in on searches for “dysthymia,” listen to me: that is a lie. You can learn more about the symptoms of dysthymia here. Like its big brother major depression, it is a very real illness but also a very treatable one. Don’t let it convince you otherwise.